While I wish I could say that the band Green Day came to the London Pen Club meeting on March 20, 2010, I can’t. I am still happy to report that we celebrated that most Irish of colours – (do I have to say it?) – a few days after the rest of the world raised their glasses in celebration of St. Patrick and everything green. I am also pleased to report that our own Irish good luck charm (Dr. Stan) and Patrick were able to join us. Attendance was excellent today – a full crowd and then some! How does a pen club celebrate “green”? Well, everyone brought their green pen stuff – pens, inks, and anything else (emphasis on the pens and ink of course!) . I could go on and on about the fun everyone had, however, as the saying goes “a picture is worth a thousand words”. I am sure you don’t want to read a thousand words of my drivel, so without further adue, here are the ink scans that my daughter Aly swabbed for us using a Q-tip and 3 pages of Nava Notes paper. My only regret was that LPC member David was not on hand so that we could have included a swab of his Sailor Jentle Tokiwa-Mat Green ink. We were also fortunate to have LPC member Rick bring his camera – I will post his photos in my next blog entry. The colours in this first scan are, from top to bottom: Conway Stewart Green, Conway Stewart CS Green, Levenger Forest, Noodler’s Green, Noodler’s reformulated GI Green, Noodler’s original GI Green and Waterman Green. 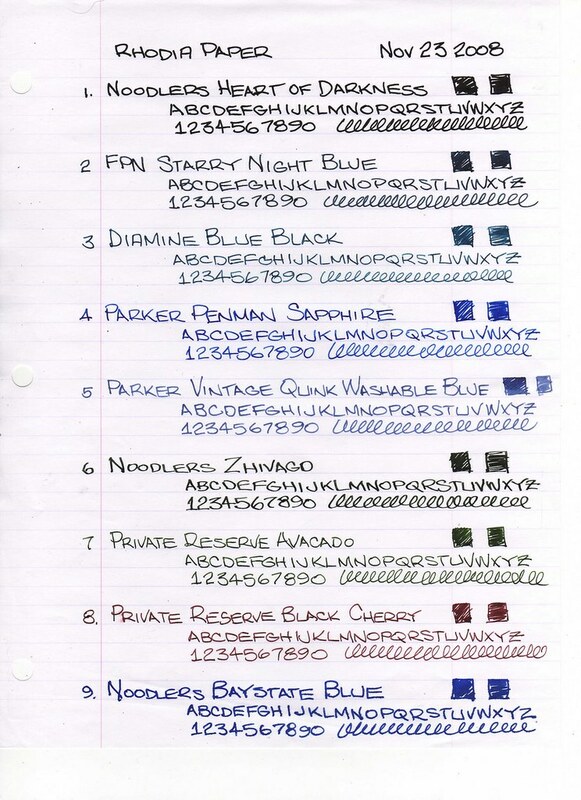 On page 2, we have: Caran d’Ache Amazon Green, Herbin Vert Empire, Herbin Vert Olive and Pelikan Brilliant Green. And finally, on page 3: Private Reserve Sherwood Green, Private Reserve Ebony Green, Noodler’s Zhivago and Rotring Green. Some very interesting colours indeed! 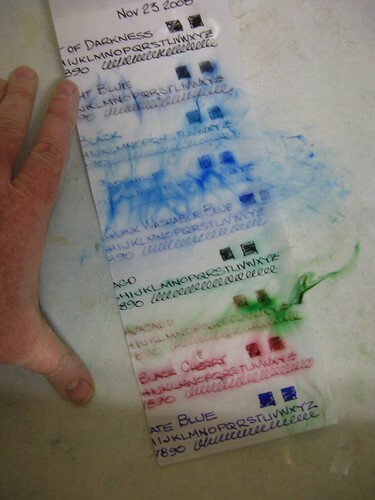 It looks like Noodler’s did a great job with its GI Green reformulation (now it is the colour that everyone expected). I must also say that Conway Stewart could have done a better job naming their two green inks. I mean, how confusing is “Conway Stewart Green” and “Conway Stewart CS Green”? Don’t believe me? Try ordering the Conway Stewart CS Green and I will bet that you will receive Conway Stewart Green at least half of the time (that is my experience!). Let us know what you think – what is your favourite and why? What ink(s) would you like to try? 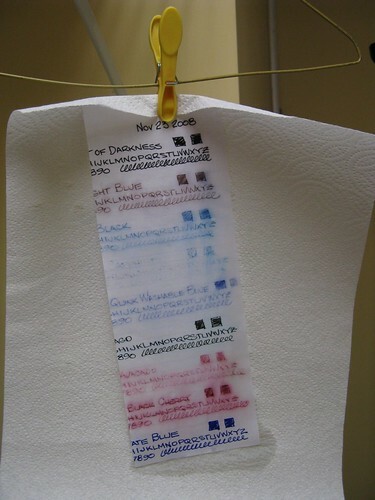 Once again it is time for another test to see how your favourite ink holds up to a soaking in water. I’ve done a couple of these in the past and it is long past time I made another. More than a year ago I wrote out on a page of Rhodia lined paper a sample of nine inks that were in my pens at the time – Noodler’s Heart of Darkness, FPN Van Gogh Starry Night Blue, Diamine Blue Black, Parker Penman Sapphire, Parker Quink Washable Blue from a vintage (c 1950s) bottle in my collection, Noodler’s Zhivago, Private Reserve Avacado, Private Reserve Black Cherry and Noodler’s Baystate Blue. As it has been over a year I have no idea what ink was in what pen or what nib size, please don’t ask. This morning while cleaning off my desk I found that page (better late than never) and scanned it using my Epson Stylus CX4800. For what it’s worth the colours look accurate on my monitor. And submerged it in a laundry tub of warm tap water and let it soak for five minutes. I didn’t agitate the page in the tub or run water from the tap over the page. Before taping it back together and once again scanning the page. Again the colours here look accurate on my monitor. So what have I learned? 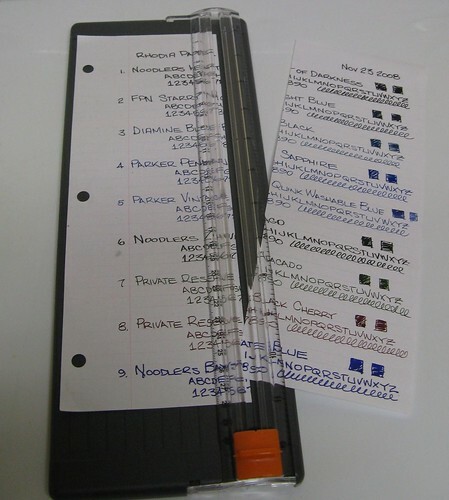 Once again, as expected, Noodler’s held out the best to my little test. The HOD looks unchanged, the Baystate Blue looks almost as good, Zhivago lost it’s green tint leaving behind black. The FPN Starry Night Blue (by Noodler’s, but not marketed as waterproof / bulletproof) changed colour to a greyish black but is perfectly readable. The Penman Sapphire fared the worse this time, it is all but gone, a few more minutes in the water and it may have disappeared altogether. 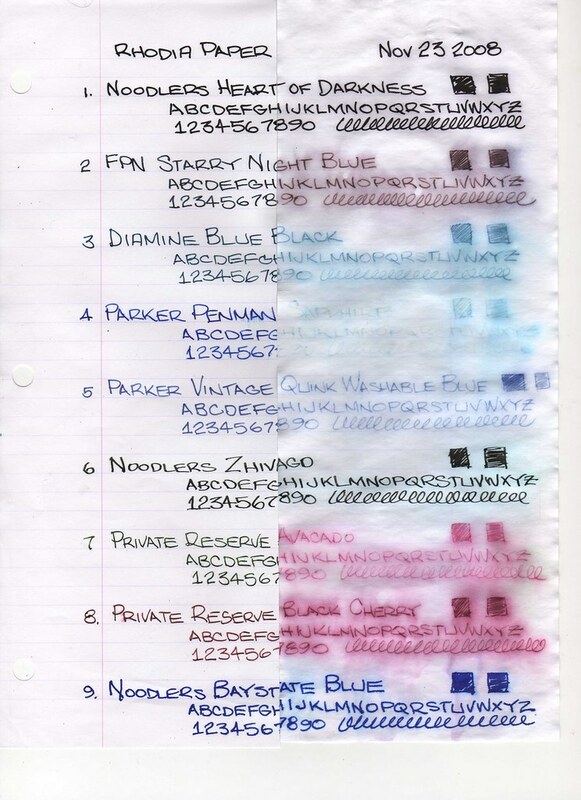 The vintage Quink Washable Blue is still legible as is the PR Black Cherry. The PR Avacado surprised me by changing colour from a dark green before the test to a red after soaking, faded but still legible. Red? Maybe need to do some paper towel chromatography on the Avacado to see the colours that are in this ink. But that’s for another day. Hope you find this little test useful.